Last week it took the S&P 500 (SPX) only four up days to erase the previous week’s five-day pullback. In the process, it took a small, but possibly important step toward removing the monkey of a five-month resistance level from its back. The SPX’s biggest week of 2019 kicked off with its second-biggest day of the year—Monday’s 1.47% rally. By Friday, the SPX had pushed above the resistance level it had retreated from the previous week, closing at its highest level since October 9—that’s only four days after (and roughly 4% below) the index’s October 3 all-time high of 2,939.86. 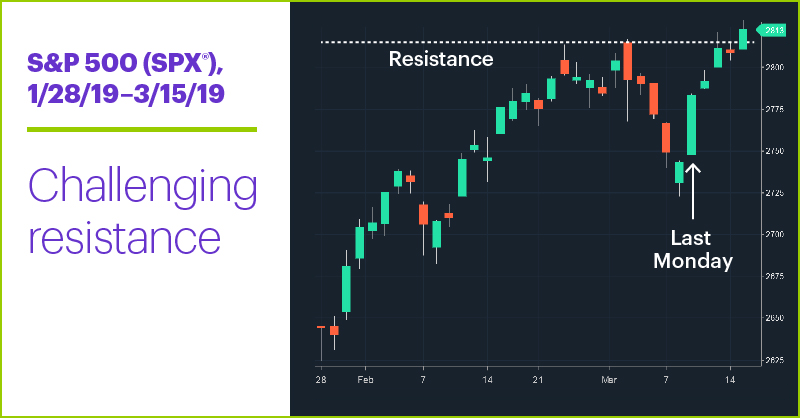 But the tech-focused Nasdaq 100’s (NDX) 2.11% rally last Monday, led by semiconductor stocks, introduced the momentum theme of the week: Tech strength. 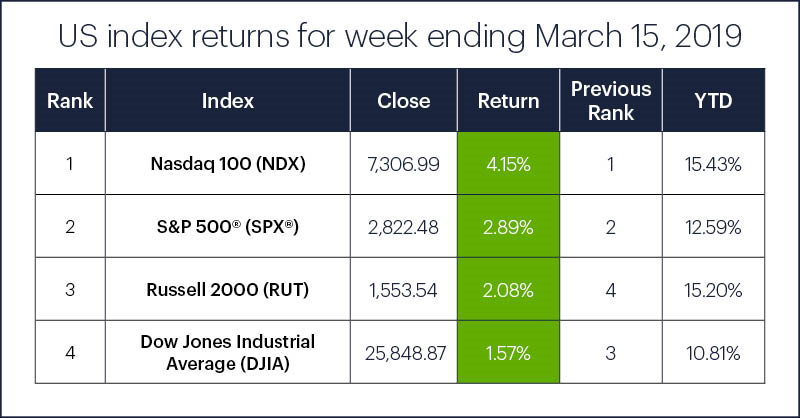 The NDX’s 4.15% rally last week was not only its largest one-week gain this year, it helped the NDX edge out the small-cap Russell 2000 (RUT) as the year-to-date US index leader. Sector action: The top-performing S&P 500 sectors were information technology (+4.9), energy (+3.22%), and health care (+3.2%). The worst-performing sectors were industrials (+0.3%), energy (+1.7%), and utilities (+1.8%). Highlight reel: On Wednesday Guardant Health (GH) rallied +27.64%, while Chinese e-commerce company Pinduoduo (PDD) dropped -17.45% on volume of (count ‘em) 56.11 million shares after posting a larger-than-expected quarterly loss.1 On Thursday, Wageworks (WAGE) surged 30.5%, while Tailored Brands (TLRD) tumbled -25%. Futures watch: May WTI crude (CLK9) rallied steadily last week, climbing above $59/barrel on Friday (for the first time since November 13) before closing around $58.75. A choppy week for gold ended with the April futures contract (GCJ9) posting a small gain for the week, up 0.2% to around $1,302/ounce. But the big move of the week came in April lean hog futures (HEJ9), which rallied 4.5% on Friday, capping a 13% gain on the week amid increased purchases from China. 1 Investor’s Business Daily. Pinduoduo Earnings Report Produces Wider-Than-Expected Loss. 3/13/19. 2 Supporting document available upon request.